I can recall very few store launches which drummed up the same excitement in advance of Urban Decay's first Irish standalone store on Grafton Street. It might sound like any other run-of-the-mill makeup launch, but Irish women are among the biggest cosmetics consumers in the world, making it big business on our shores - and Urban Decay is a behemoth in beauty. On Wednesday night, glitterati will descend on the store for a sneak peek of what is bound to be one of the busiest premises' on the bustling shopping street, so Independent.ie Style got an exclusive first look at the new store, a labour of love which took two years in total. With counters in Debenhams across the country, as well as online delivery, Irish shoppers are already familiar with Urban Decay's extensive offering, but the brand new 1,695 square foot premises in Dublin raises the bar and managers to maintain the ethos which its devoted followers so love, while also remaining non-intimidating enough to new customers. On your right, you are greeted with a seemingly endless row of selfie stations, all equipped with phone chargers and ring lighting to rival any Kardashian; on your left, a 'lipstick wall' which features every product from its Vice collection, available in all 100 shades; a foundation wall, a highlighter and blush wall. Basically, if there's a cult product, it has a wall. On the second floor, there are more products and UD imagery synonymous of the impossibly cool California brand, with Vice brand ambassador Ruby Rose getting pride of place. There's six makeup stations, all of which feature the staple lighting for that perfect selfie and a separate selfie wall, complete with props. Even better? For the makeup lover in your life, it can be booked for private events. This marks the ninth boutique store in the UK and Ireland, but the first of its kind in Ireland. And while the brand's origin story is steeped in the US, it is something of a homecoming for many of the brand's Irish employees. 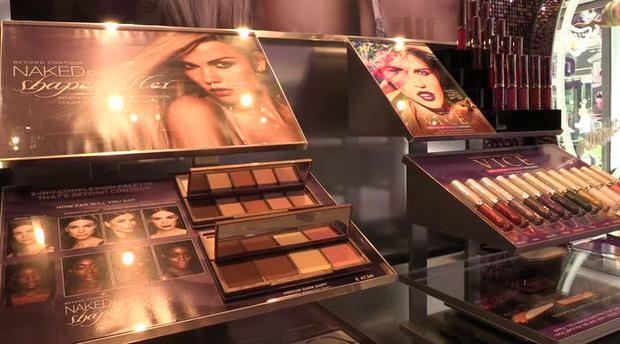 Isabel Malbois (née McCarthy), the General Manager of Urban Decay UK & Ireland has Irish roots, while Donna Crawford, a former makeup artist who was the brand's first ever Irish employee, has risen through the ranks to Sales Director of UK & Ireland, flew in especially for the occasion. As for the customers, this is a brand that knows how to treat you: after the limited release of the new Naked Heat eyeshadow palette nearly broke the internet earlier this month, when its doors open on Thursday morning, the first 100 customers will have the chance to get their hands on one. Others can have a lipstick from the Vice range engraved with their initials after purchase as a memento.